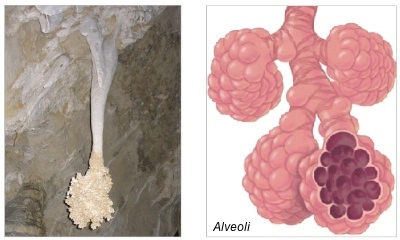 Posted by Jill S. Schneiderman in Anthropocene, geologic time. I’m about to head out to West Texas on a geology field trip with a group of sedimentology students, a colleague, and my 10 year old child in order to look at sedimentary rocks formed hundreds of millions of years ago. If I weren’t leaving shortly I’d take more time to write about the February 27 New York Times editorial that broadcasts what should be (but is not) widely known. 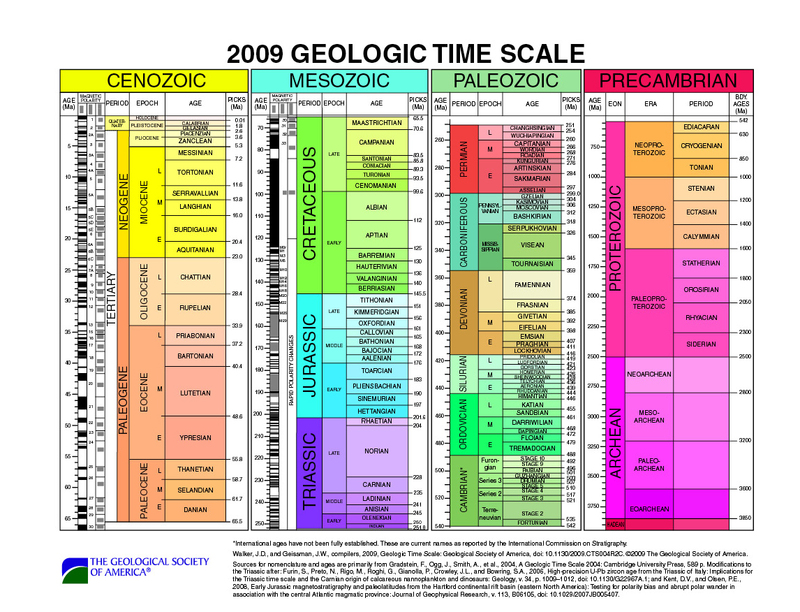 We live in a geological time period that we used to call the Holocene (the Recent). The New York Times echoes what a few scientists have been saying for a while now: it’s not the Holocene, it’s the Anthropocene. I explain this further in my May 20, 2010 comments on this blog. Posted by Jill S. Schneiderman in earth system science, geologic time, geology, Hudson Valley, The New Yorker, Walkway over the Hudson. In the February 28 issue of The New Yorker, Ian Frazier has a lovely short piece entitled “Bridge” about the rejuvenation of the old Poughkeepsie-Highland Railroad bridge into what we Poughkeepsie-dwellers like to think of as the longest elevated pedestrian bridge in the world. For those who don’t subscribe to the magazine, you can access Frazier’s piece at the Walkway Over the Hudson website. I know that Frazier means far away in space but I also think that people need to be aware of the fact that they are often in the presence of things that are really far away in time. 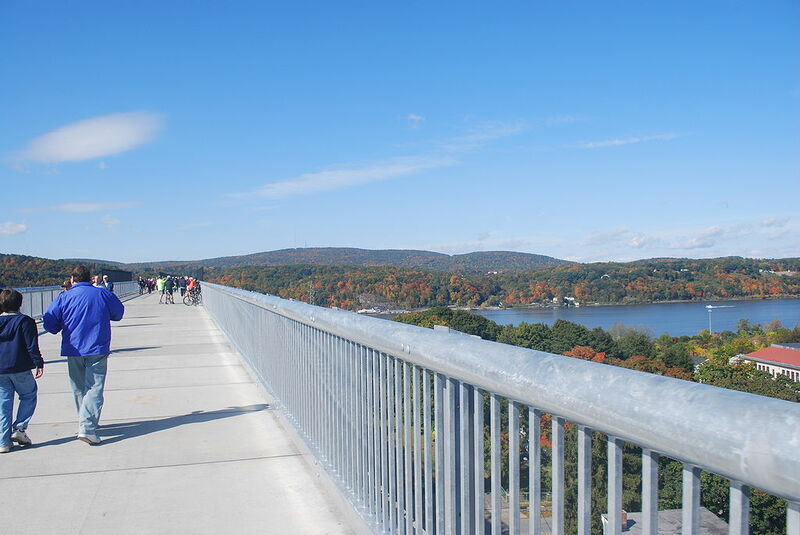 The Walkway facilitates that as well because high above the River we have a bird’s eye view of the millions of years of Earth history that the Hudson Valley exposes. For those whose curiosity about the valley is peaked by Frazier’s column, here’s a short piece that I wrote for the Poughkeepsie Journal,”Rocks Serve as Snapshot of Valley’s Timeline” that explains some of what walkers can engage as they stroll along our magnificent pedestrian bridge. The names Alexander Hamilton, Aaron Burr, George Washington, Benedict Arnold, Billy the Kid, Thomas Cole, Frederic Church, Edna St. Vincent Millay and Pete Seeger conjure up our region’s rich historic past. But what of its prehistory? Rocks along both banks of the Hudson River and throughout its valley and adjacent mountains record a long and complex geologic history. On this land, human history has played out. Much of the geologic drama occurred in prolonged pulses of activity during the Paleozoic, Mesozoic and Cenozoic Eras — 570 million years, but only the latest 13 percent of geologic time. Though remarkable in the geologic scheme of things — uplift of Himalayan-sized mountains, spreading of inland seas of which there are no comparisons today save perhaps Canada’s Hudson’s Bay, tearing of continental crust, and burial by mile- thick ice — we read the record of these events in subtle clues from our area’s rocks. Compared to human events over the last 400 years and those that will transpire in the next millennium, geology seems to provide a record of change whose pace requires patience. The Highlands then run north to Breakneck and Storm King mountains, and they consist of more than 1 billion-year-old, coarsely crystalline granites and magnificent marble-cake gneisses. They are the bedrock of our area, the core of our continent, metamorphic rocks that tell us they’ve suffered intense pressures and temperatures from overlying rocks. Hard and unfractured — how remarkable it is that the deepest part of the Hudson River cuts through them. Cement from our region and crushed stone that have supplied New York’s building industry come from dolostones, magnesium-rich limestones north of the Highlands. New York Trap Rock at the Clinton Point quarry to this day mines this material, whose existence records the presence of a shallow sea that covered our area about 500 million years ago. Closely associated with this carbonate rock is a shale that occurs throughout much of the Poughkeepsie area. This rock, too, is a marine sediment, akin to the material deposited in shallow offshore seaways. Though not especially rich in fossils, this rock unit, from the Ordovician period at least 435 million years ago, sometimes contains brachiopods, two-shelled marine organisms that superficially resemble but are substantially different from clams of today. On both sides of the Hudson River in Poughkeepsie’s vicinity, topographically elevated regions of the Taconic mountains to the east and the Catskill mountains to the west remain as reminders of a geologically active time in our region’s past. Approximately 450 million years ago, an island chain much like Japan collided with North America and raised up the Taconic mountains. What’s left of them today is their roots. Heated and crumpled, the Ordovician shale previously laid down on the shallow sea endured a kind of pressure-cooking that turned the shale into slate, which becomes coarser-grained schist as one travels east from Poughkeepsie into Connecticut. Beautiful red garnets, elongated white needles of sillimanite, and lustrous brown staurolite crystals adorn mica schists that sparkle in the sunlight as we go east toward the Taconic mountains on the border of northeastern Dutchess County. Not long after this, we believe that a meteor may have hit the Earth just west of the current-day Hudson River at Panther Mountain in the Catskills. There, a circular pattern six miles across is formed by the Esopus and Woodland creeks. For streams to travel in a circle is very unusual and has led some investigators to suggest the presence of an impact crater in 400-million-year-old sedimentary rock that had previously been laid down in a shallow sea. Because sediments were being deposited in the shallow sea, the crater was buried and preserved much like a fossil. The streams have carved out a circular outline around it though the crater itself remains completely buried. After the Taconics rose in a mountain-building event known as an orogeny, the North American continent collided with an even larger land mass farther east. This orogenic event raised up the Acadian mountains, a chain of perhaps Himalayan proportions just east of the Taconics. Sediments shed from the Acadian mountains accumulated as blankets of conglomerate, sandstone and shale in a delta. Sediments of the Catskill Delta were almost two miles thick. Today those sedimentary strata are visible as the Shawangunk and Catskill mountains. The Devonian sandstones of the Catskill Mountains, at least 345 million years old, are what have supplied the Catskill bluestone, blue from feldspar grains in it, for curbstone and flagstones throughout the United States. Devonian limestones forming the spectacular escarpment overlooking the Mohawk and Hudson valleys contain an abundant assemblage of life that teemed in the area’s seas 345 million years ago. Stream beds cutting through the limestones at John Boyd Thatcher state park in Vorheesville show that corals, crinoids, trilobites and brachiopods thrived during that time. A period of quiescence followed in this area until the Atlantic Ocean began to form. The spreading of continent crust that accompanied its formation tore the crust so valleys formed. Into them poured sediments, like those which today fill the lake- and flamingo-rich valleys of east Africa. As dinosaurs stomped atop these sediments, magma (molten rock) was injected into them. To this magma we owe thanks for the magnificent Palisades on the west side of the Hudson River. For the next 185 million years, things were quiet in our region. The next major episode of activity reflected in our rocks is glaciation. Though glaciers began to advance on the North American continent around 2 million years ago, our area records only the most recent advance of ice. Approximately 40,000 years ago, the last glacial advance scraped over the area’s bedrock and sediments. When the ice retreated, it left behind a trail of kettle holes, moraines — sediments pushed aside like a snow plow creates drifts of snow — and glacial striations, scratch marks that we can see atop Bonticou Crag in the Mohonk Preserve of the Shawangunks in Ulster County and across the river into Millbrook in Dutchess. Perhaps most significant to valley residents, the ice carved a deep fjord which today is the Hudson River. After the ice departed, the Hudson River became Glacial Lake Albany and Glacial Lake Hudson. Influxes of clays into those lakes ultimately supplied materials for the brickyards of our area. Sediment-laden glacial meltwaters continued to course down the Hudson, across today’s submarine continental shelf, and gouged out the Hudson River submarine canyon in today’s New York Harbor. Thousands of years after the valley’s glaciation, humans evolved. Clearly, we have been on this planet only for a geological instant. Despite this fact, people have managed to scar the surface of the Earth. Pits from quarry operations, PCBs (toxic industrial oils) in the bottom sediments of the Hudson River, metal-laden landfills, acidified lakes and streams each testify to that. Such transformations of natural resources affect our ability to provide what every human being deserves: clean soil, water and air. Since we live on the eastern, passive edge of the North American continent, a place unlike the quake-plagued West Coast, we can be pretty sure that no catastrophic geologic change will occur in our area in the next millennium. But how we treat the Earth will profoundly affect our lives. We cannot afford to treat this planet as if it were an unending cornucopia of natural riches here for us to take and haphazardly discard. As we strive toward a sustainable future, we must all come to appreciate how the Earth works.